The FSM sports delegation, attending the Rio 2016 Olympic Games (Rio 2016), will include five athletes (Debra Daniel, Dionisio Augustine II, Larissa Henry, Kitson Kapiriel and Chieng), five coaches (Elias Rodriquez, Sweeter Daniel, Rendy Germinaro, Lestly Ashby and Erick Divinagracia), one Chef de Mission (Sterling Skilling), one press attaché (Curtis Graham), two Administrative Staff (John Howard and Ron Etscheit) and FSM National Olympic Committee (FSMNOC) Vice President Ted Rutun and Secretary General Jim Tobin. Four-time FSM Olympian, Manuel Minginfel, famous male weightlifter from Yap State, was planning on competing in the 2016 Olympics but had to return to Yap due to an illness in his family. Over 10,000 athletes from 205 countries will participate in 28 sports at the 2016 Olympics. The majority of TEAM FSM, led by Chef de Mission Sterling Skilling, from Kosrae State, will depart the FSM on July 30 and arrive in Rio de Janeiro on August 2. The Opening Ceremony will be held at 7:00pm, Friday, August 5. Chieng will be the FSM flag bearer. This will be the fifth Olympic Games that the FSM has participated in beginning with the Sydney 2000 Olympic Games. 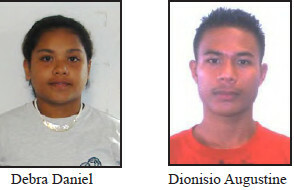 Debra Daniel and Dionisio Augustine II, both from Pohnpei State, will compete in the 50-meter free style in Swimming on August 11 and 12. Larissa Henry and Kitson Kapiriel, from Pohnpei State, will compete in the 100-meter dash in Athletics on August 12 and 13. Chieng will compete in Boxing from August 12- 19. The Boxing competition is single elimination and there will be 12 female boxers in the 57-60kg division. For the past 2 years, Chieng and Daniel have received International Olympic Committee Rio 2016 Athlete Training Scholarships, along with Minginfel and FSM male wrestler Jk Kaminanga from Chuuk State. All four scholarship holders tried to qualify for Rio 2016 by competing in 2015 and 2016 Olympic Qualifiers, including Oceania and World Championships in each of their sports. Augustine, Henry and Kapiriel received FSM National Olympic Committee training grants to properly prepare for Rio 2016. The FSMNOC applied for and received International Olympic Committee and Rio 2016 Organizing Committee grants to fund the costs of economy airfares and Rio accommodation for all TEAM FSM members. NIKE international provided competition and team uniforms. The FSM National Government funded uniform printing and shipping. Local sponsors: Palm Terrace Shopping Center, Etscheit Enterprises, Matson, Carolina Fisheries, Lyon and Association and the Embassy of the People’s Republic of China provided funding for TEAM FSM travel stipends and transit accommodation. The FSMNOC, with funding support from the IOC, is working with FSM Telecommunications Corporation to stream the live television broadcast of the Rio 2016 Olympic Games on Yap, Chuuk and Kosrae cable TV stations, most likely from a feed from Fiji One TV in Fiji. We are not able to confirm if Pohnpei will be able to receive the broadcast feed on Island Cable TV.